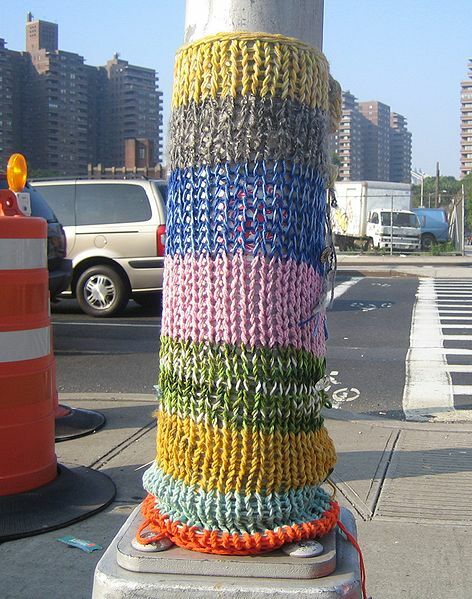 I came across some info, maybe in Craft Magazine, a while back about Urban Knitting - basically knitting and "tagging" urban fixtures eg. light posts, signposts, door handles, chain links, fire hydrants etc. The reason I'm motivated to post about this is as I was driving down Brooks Street in Missoula, MT yesterday I spied a couple of adorned light posts. I wasn't able to shoot a photo, as I was driving down the street, but I plan to go back and snap a couple of shots of what I saw. 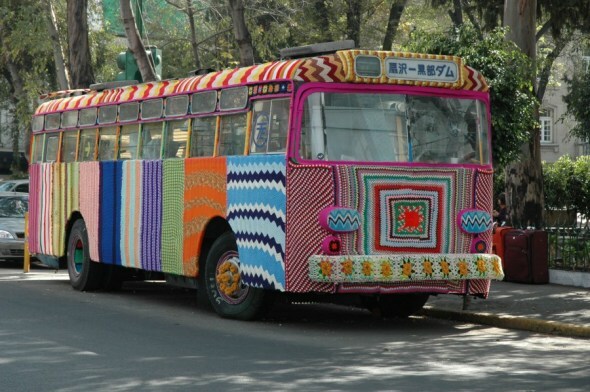 This wiki page has an awesome explanation and info on a group called knitta that started doing this in Houston, TX (wiki page is where my photo came from). It looks to me, from the tiny bit of research I did, that this started way back in 2005 - back in the day - heh. 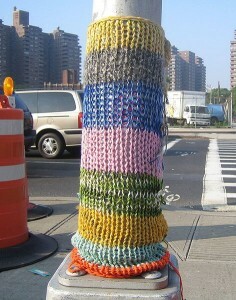 The motivation was unfinished projects, I'm pretty sure all of you knitters have a handful of those. Anyway I plan to yarn bomb something in my town, yo. And I think you should too. If you do happen to do so and email me a photo and leave a comment I will choose one lucky winner to receive a hank/skein of yarn. I'm giving away a skein of one of my favorites, a light green (color number A031) Sheep Number Two. The catch...I need at least 10 photos to conduct my giveaway so start knitting or crocheting whatever you fancy. Contest ends March 31st and the giveaway will take place on April Fool's Day - as long as I have 10 photos...and I'll share the photos (along with links to your blogs) in a post on/near the 1st. Ooh, and this blog post has some amazing photos of a tree, or several. Get your creative juices flowing and cozy up some urban fixtures where you live. I can't wait to see what you all have to share.